AX WONDERS: AX 2012 CIL - How does it work? On this post I would like to talk about a bit more about the CIL and what happens in the background. Recently I had to go through a process to find a CIL error I got after deploying a service. You can read my post solving the error "The CIL generator found errors and could not save the new assembly" for more information on this. After digging a bit more on the CIL errors, I started researching on how exactly the NetModule files are generated under the XppIL folder and why. In addition, I also was intrigued by the source files and their relationship to debugging services and or batch jobs in Visual Studio. Just for the record, I’m not an expert on this, and the following information has been taken from different sources and from my own experience in the past few hours being “exposed” to the services virus (it is kind of addictive). So, what is CIL? 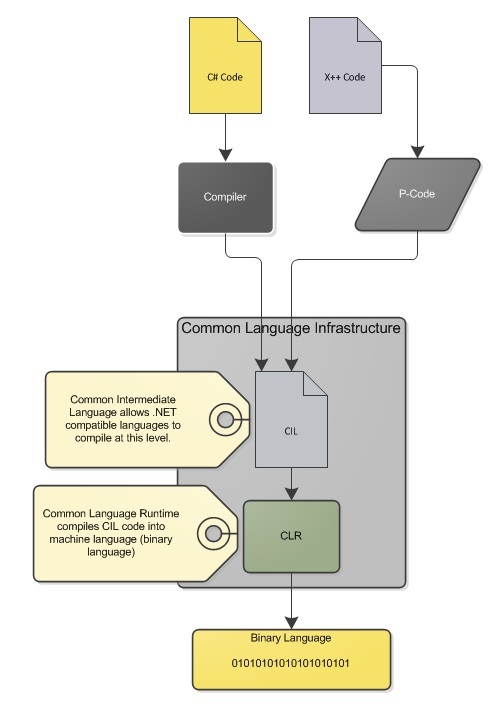 CIL stands for Common Intermediate Language and it works together with the CLI or Common Language Infrastructure, which is basically a set of rules on programming languages that will compile with the CIL. I created a diagram to help me understand this concept on a visual way. Please note that I took the diagram from a book, but I modified it to my own needs. As you can see, now we have the ability to compile P-Code to CIL, and therefore AX 20212 is able to run X++ code directly into the CIL, which is much faster the P-Code compiler we had before. As you probably know, we have two types of CIL compilations, the incremental CIL and the full CIL compilation. The major difference between the two of them is that the incremental CIL would compile only the objects that were modified since the last incremental compilation. For what I have learned, the full CIL generation is mandatory when we do modify anything on the XppIL folder. On the XppIL folder, I noticed that we have a bunch of files there. These files are NetModule type files and they only contain type metadata and compiled code. It is important not to confuse a NetModule type file with .NET assemblies, as these contain and assembly manifest and managed code. Now the really interesting portion of this is that within the XppIL folder there is a folder named “source”, and within this folder we find a bunch of files with the .xpp extension, which have x++ source code and are used to debug CIL code in Visual Studio when working with services and batches. Further, another interesting point to this is that the “existence” of the source folder is directly related to our server configuration when choosing to enable debugging on the server. Fantastic post - but where do we find AX 20212? Just a joke - nice work and which book did you find that diagram? I created it myself. If you need it - just take it - we are here to share.